John Gruber has been discussing (again) his preference for Apple's older keyboards. I prefer Apple's older keyboards too, because they stopped making their best keyboard. This is a huge gap in their product lineup. Gruber prefers the ancient Apple Extended Keyboard II that was first released in 1990 and discontinued in 1999. 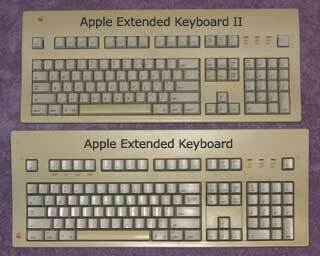 Thomas Brand responded with claims the original Extended Keyboard from 1987 is superior. The differences between the models is subtle, but since the keyboard is a primary point of interaction with your computer, many people have strong opinions. And since this basic design was sold for more than 13 years, many people are very attached to these keyboards. I even have an Extended II in my closet somewhere, and I remember using the original model back in 1987. These keyboards are massive, and were intended to compete with IBM's famous Model M keyboard that first shipped in 1984. I sold hundreds, if not thousands of those keyboards from Apple and IBM, and it got me reminiscing about the keyboards I have used. And I came to the conclusion that keyboards probably shaped my career more than any other computer component. The first computer keyboard I ever used was an IBM 029 Key Punch. I recently wrote about using a key punch back in late 1970 and early 1971, that was my first experience programming computers. I will never forget the sound of a room full of key punch machines, it was quite a racket. A key punch was incredibly difficult to use because you could not see what you were typing. The column you were typing on was under the punch mechanism. If you wanted to see what you had typed, you had to press a key and the card would pull back from under the mechanism so you could look at it. When I was in junior high school, I decided to take a typing class since keypunching was so difficult, one mistake and you ruined the card and had to start over. Typing class was considered vocational education for girls who wanted a career as a secretary and did not want to go to college. I mercilessly pounded away at the manual Olivetti typewriters for months and eventually achieved the 30 words per minute required to pass the typing class. The next computer keyboard I encountered was a Teletype ASR-33. My dad got one for his flower shop so he could send and receive orders by Telex. I discovered it could connect to the University's computers by modem at 110 baud. The keyboard had the strangest bouncy feel. 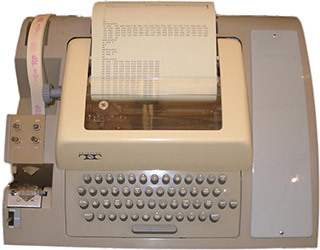 You had to press hard until the solenoid activated and the key would spring back up as the machine typed the character on paper. As I learned more about computers, I encountered many different keyboards. 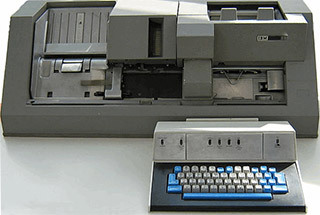 At first, they were printing terminals like the IBM 2741 "Selectric Terminal" or the DECwriter II. But soon I was using graphics terminals like the exotic (but clunky) PLATO IV and even the advanced Tektronix 4010 Vector Graphics Terminal. Oh there are too many to count, but I remember them all. One keyboard stands out as exceptionally important to me. I have owned it for about 35 years, longer than any other keyboard. When I bought my first computer, I agonized over the keyboard. I wanted an Apple 1 but it came with no keyboard, you had to make your own. One of the few existing Apple 1 computers with a keyboard is in the Smithsonian Institution. It has a hand made wooden case and the right shift key is broken off. It looks like it was adapted from a Teletype, since it has strange keys like RUB OUT and HERE IS. I didn't have any machines to cannibalize for parts, so I had no way to make something like this. So instead of the Apple 1, I bought a SOL-20 kit which came with a pre-assembled keyboard. In retrospect, this was a poor choice. Both computers are considered collectible. An Apple 1 is worth tens of thousands of dollars in any condition, but my SOL is barely worth what I paid for it. And worst of all, every SOL keyboard rotted away with age after about 15 years. It took me many years to locate parts to fix the keyboard, but I finally managed to restore it back to working condition. For all that trouble, it would have been easier to build an Apple 1 keyboard myself. The SOL keyboard was a strange design, it didn't use standard key switches like the Apple II. Those keyboards really made my career as a computer tech. The key switches were durable but still broke a lot, especially when people pounded on the keys while playing games. Most shops could only replace the whole keyboard, which cost a lot of money. But I took the advanced repair class at Apple's Texas factory and I learned how to replace an individual key switch. I recall the key switches only cost about a dollar, but there were 2 or 3 different types, and they weren't interchangeable so I had to keep an assortment of keys in stock. I would replace keys for a flat rate, I don't remember what I charged, but it was cheap compared to replacing the whole keyboard. I could disassemble the computer, pull out the keyboard, desolder the old key and put in a new one, then reassemble everything in about 15 minutes. I made a lot of money replacing Apple II key switches. That really launched my career in computers. But I don't want to reminisce about every keyboard I ever used over the decades. Let's get back to Gruber's keyboards. Apple now makes only low profile aluminum keyboards, similar to the keyboards they use on laptops. They're great keyboards and look beautiful, but Apple has made some changes that I don't like. Now the Apple Wireless Keyboard is standard, but it's not an extended keyboard with a numeric keypad and a full 109 keys. Apple does sell a full extended keyboard in the low profile aluminum style, but it's not wireless. You have to plug it in with a USB cable. I didn't realize how annoying this is until I got a wireless keyboard. And here is the problem: Apple does not make any full size wireless keyboards. If you want a full keyboard, you need to connect it wires. This is a huge gap in their product lineup. The last full 109 key wireless keyboard was the Apple Bluetooth Keyboard, but it has been discontinued. That's the keyboard I'm using right now. It's probably the last keyboard Apple will ever make with full travel key switches. It's going to be another classic that people will use for years and years. I bought mine in 2006. But there's one particularly annoying feature of this keyboard. It has a transparent plastic case. It looks beautiful when it's new. But over time, keyboard crud falls through into the edges of the case and it looks awful. Some people recommend disassembling the keyboard and cleaning it in a dishwasher. I'm about ready to try it. Maybe it will be clean enough to work for another 6 years. So people like me have a great attachment to their favorite keyboards. I completely understand Gruber's love for his old Apple Extended II keyboard, and why he bought a spare to use if his current keyboard dies. I'm thinking of buying a spare Apple Bluetooth keyboard as a backup. Gruber thinks the Extended II is the best keyboard Apple ever made. I think the Bluetooth keyboard is the best Mac keyboard, Apple will probably never again make a anything as good as this. But there is one keyboard that I consider the best keyboard Apple ever made, and the best keyboard ever, period. It is very rare, hardly anyone has ever touched one. But I used one at work every day. Notice it has two Apple keys on it, this foreshadowed the Mac's Apple and Option keys. It was Apple's first aluminum machine, it was solid as a rock and you could really pound the keys. The ergonomics were nearly perfect. I remember using a typing test program and after some practice, I got above 110 words per minute. I've never been able to surpass that speed on any kind of keyboard. That is what makes it the best keyboard ever, on any computer, it is the best tool for the job, especially if you're good on a keyboard. That is the keyboard from the Apple ///. I just bought the older Apple clear plastic style keyboard you mentioned, except with a USB wire...i don't like having to change batteries. I also don't like Apple's flat keyboard. I kept hitting the "caps lock" key every time i hit the "A" key with my finger. It was very annoying. The old keyboard has a bigger space between the "A' and "Caps lock" keys. I realized how used to the feel of the old keyboard i am, when i typed on the newer version. I also don't like that it's flat and the back end of the keyboard isn't raised up as much. The table my IMac is on, is higher than normal, so i need a keyboard that's raised more on the back end, in order to see and use the keys more easily. In my opinion, Apple's newer keyboard appears cheaper. Other than the aluminum, there's not much to it. Not as much plastic, that's for sure. I like the older version. Change isn't always for the better. I'm also not very happy with the changes that came with the new Imac. I had to turn off the automatic search function. I'd type a sentence, and it would sometimes be erased before Google searched. The performance isn't as good as before, it seems to me, but Apple has to keep changing things in order to keep on the "cutting edge" and stay fresh, i guess.